The holidays are here and that means it’s time to find the perfect gifts for your loved ones! Are you shopping for someone who has everything? This year, don’t give them something that will get shoved to the back of the closet- give them the experience of a weekend getaway! With Westmark’s featured holiday special, guests can save 10 percent on the best available rate at your hotel stay through April 30, 2016, using the code SAVE10. Or pay a visit to one of our conveniently located hotels to do some of your holiday shopping and make some memories while in town. Visit the Westmark Whitehorse Hotel & Conference Center for a getaway in the town that was just named one of the six best places to travel in the world by Air Canada, alongside destinations like Dubai and Rio de Janeiro. This big-time nod was due in part to Whitehorse’s robust craft beer and cocktail scene. Try Winterlong Brewing Co.’s Log Splitter Smoked Porter or Sweater Weather Oatmeal Stout. And if you’re in town for the holidays, join in on the festive city lights tour and free skate on Dec. 19. Our Westmark Fairbanks Hotel and Conference Center in Alaska’s Golden Heart City is located in the heart of downtown Fairbanks. Take a day trip to North Pole between Dec. 17 and Jan. 5 to see Christmas in Ice, an ice sculpture park next to the Santa Claus House. 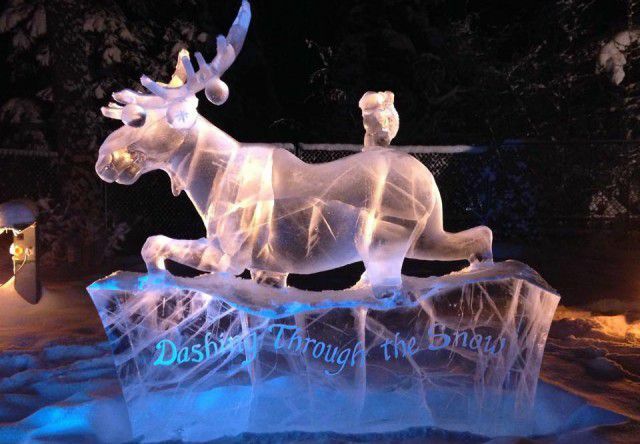 Not only are there gorgeous Christmas-themed ice sculptures to gaze at, there are ice mazes and ice slides to play on. New sculptures and park pieces are added nearly each week so you might want to plan more than one excursion. Or, get in touch with nature this holiday season and stop by Creamer’s Field for a family ornament-making extravaganza using materials like branches, dried fruits, seeds and more. Looking for a more urban getaway? Anchorage is the perfect locale for a weekend away from home with urban trails, a wide range of entertainment options and world-class dining. The Westmark Anchorage Hotel is conveniently located in the heart of downtown, steps away from the city’s most exciting events. Visit the Alaska Center for the Performing Arts and see “A Christmas Carol” on the big stage Dec. 18-27. Or for a more intimate theater experience, see the legendary Mr. Whitekeys perform “Christmas in Spenard” at Taproot. In Juneau, stay at the Westmark Baranof Hotel and enjoy the amenities of the state’s capital city. If you’re in town on Dec. 19, don’t miss Eaglecrest’s Downtown Rail Jam. Eaglecrest Ski Area staff and volunteers will haul snow downtown to create the first ever urban terrain park in Juneau. Bring your skis or snowboard and practice some tricks on the terrain park’s scaffolding, ramps and 10-foot park box. Even if you don’t ski or snowboard, this will be a fun event to watch and the DJ, light show and beer garden are sure to keep you entertained all evening long. Whichever destination you choose, Westmark Hotels are the perfect home base for a weekend getaway. Happy Holidays!